ALAMEDA, Calif. (KGO) -- An Alameda fire rescue swimmer pulled a drowning man out of a submerged vehicle in the Oakland Estuary Saturday morning, a fire captain said, but the victim did not survive. Dive crews are still searching for the additional victims that may have also been in the car. Emergency crews were called to the waterfront near Blanding Avenue and Broadway at 7:01 a.m. Saturday morning on report of a submerged vehicle, according to Capt. James Colburn with the Alameda Fire Department. 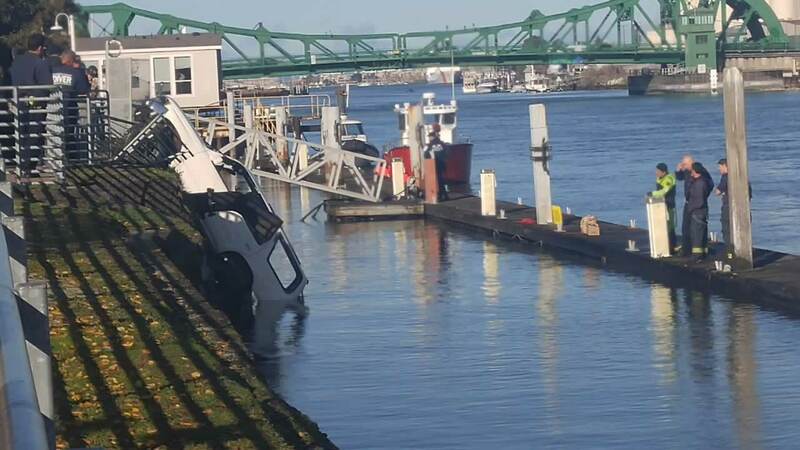 Witnesses told investigators that a vehicle had been seen speeding through a parking lot before it went up onto a sidewalk, thru a barricade and into the water, Colburn said. A rescue swimmer with the Alameda Fire Department was able to pull a man out of a vehicle. He was transported to Highland Hospital, and pronounced deceased sometime after leaving the scene, according to Colburn. There were initial reports that as many as two other people were in the SUV, and might have still been in the water. Crews on scene include personnel from Alameda police and fire, Southern Marin Fire Protection District, the San Francisco Fire Department, the Alameda County Sheriff's Office and the United States Coast Guard.